I spent most of my 20 years in the US Army as a translator of Mandarin Chinese and Japanese documents. I have also studied, to a greater or lesser extent, Taiwanese (Holo/Hokkien) Chinese, Arabic, Hebrew, Malay/Indonesian, Vietnamese, Spanish, German, and French. I attended the Defense Language Institute Foreign Language Center at the Presidio of Monterey, California for 47-week courses in Mandarin (1963), Japanese (1967-68), and Egyptian Arabic (1973). I also spent a year there (1979-80) on a team writing Mandarin extension courses for interrogators. I lived in Taiwan for 20 months (1964-66) and in Japan for 7.5 years (1968-72 and 1976-79). Unfortunately, I didn't get much chance to use my Arabic, so my skills have completely atrophied. I haven't worked as a translator since 1980 and I'm not a linguist, but I'm still fascinated by languages and linguistics. I'm very interested in learning about Chinese linguistics, especially dialectology and reconstructions of earlier stages of the language. I'm also interested in Japanese as it relates to the reconstruction of Chinese. The Chinese dialect that interests me most is my late wife's dialect, Taiwanese Holo (also known as Hokkien). I've put up a Web page on the missionary romanization system, which is the most common system used for Holo. PLEASE NOTE: I get lots of requests for info on Japanese and Chinese fonts, and even for free fonts. I use the fonts that are included as a part of the Macintosh Operating System. I cannot send out fonts, and I don't know where else to obtain them. Some of the links below may contain information on fonts. Other sources of information are folks on the sci.lang.japan newsgroup for Japanese fonts and the CHINESE and Mandarin Language Learners mail lists for Chinese fonts. Please do not send me e-mail asking me to send you fonts. Someone pointed out that some Asian fonts for Windows are available from UnionWay. I'm not familiar with them, and can't confirm this (and don't use Windows), but I thought I'd add the link, anyway. I now publish a Macintosh-based database program, iDataTM Pro, which is handy for storing all kinds of info in various languages. 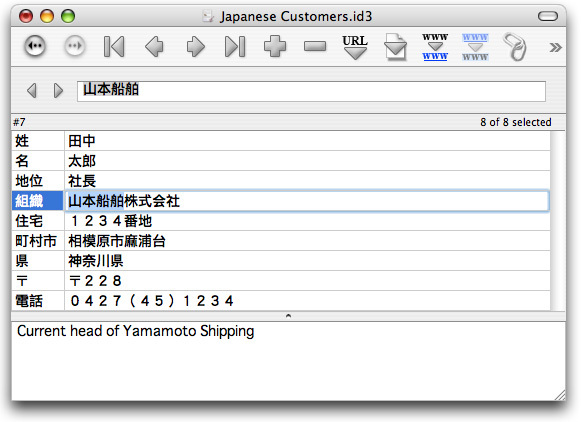 Here's a sample (made up) file of Japanese-language addresses. iData Pro is user-configurable, and has a very fast search function, too. It can also print labels and envelopes. Disclaimer: My listing of commercial sites does not constitute an endorsement of any kind. Visit at your own risk. Also, I don't do much investigation of linked Web sites, other than taking a quick look when someone requests that I add a link to their site, so take reasonable care when dealing with them. Also, please let me know if you encounter any unethical behavior on the part of any of the site owners. This is a list for promoting communication among teachers, researchers and students of Chinese. Topics for discussion may include 1) theory and practice in teaching Chinese as a foreign language, 2) linguistics, literature and their applications to teaching of Chinese, 3) technology and teaching, 4) creative classroom activities or 5) any other relevant issues. To subscribe, send a message to: CHINESE-REQUEST@KENYON.EDU. Serge Flore of the Netherlands has provided a chart of Japanese kana from a Dutch book on Japan that was printed in the year 1733. In addition to "catta canna" (katakana) and "firo canna" (hiragana ), it also includes what is referred to as "imatto canna", probably "yamato kana". These appear to be single examples of what are now referred to as "hentaigana". I'm especially interested in adding more links to language topics, including personal home pages.